Bloom gin, inspired by nature, is a delicate floral premium London dry gin, enriched by the natural botanicals from an English country garden. The chamomile, pomelo and honeysuckle create a distinctive taste, perfect for those who appreciate a more delicate and subtle gin-drinking experience. 1. 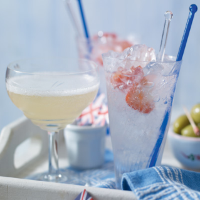 Shake together the gin and peach juice with ice in cocktail shaker, pour into open glasses. 2. Top with the Prosecco and serve. This recipe was first published in Tue May 15 15:34:00 BST 2012.